A collection of photographs from the campaign. From top and left to right: Ottoman commanders including Mustafa Kemal (fourth from left); Allied warships; the view down to Anzac Cove; Ottoman soldiers in a trench; and Allied positions. ↑ Travers 2001, p. 13. ↑ Jung 2003, pp. 42–43. ↑ 3.0 3.1 3.2 Aspinall-Oglander 1929, p. 395. ↑ 4.0 4.1 Erickson 2001a, pp. 94–95. ↑ 5.0 5.1 Erickson 2001a, p. 94. ↑ Dennis et al 2008, pp. 32, 38. ↑ Lewis, Balderstone & Bowan 2006, p. 110. ↑ McGibbon 2000, p. 198. Basarin, Vecihi; Basarin, Hatice Hurmuz (2008). Beneath the Dardanelles: The Australian Submarine at Gallipoli. Crows Nest, New South Wales: Allen & Unwin. ISBN 9781741755954. Bean, Charles (1941) . The Story of ANZAC from the Outbreak of War to the End of the First Phase of the Gallipoli Campaign, May 4, 1915. Official History of Australia in the War of 1914–1918. I (11th ed.). Sydney: Angus and Robertson. OCLC 220878987. Carlyon, Les (11 November 2004). "Australian War Memorial Anniversary Oration: Gallipoli in a Nation's Remembrance (soundtrack and text)". Australian War Memorial. สืบค้นเมื่อ 7 December 2008. Gilbert, Martin (2004). The First World War: A Complete History. New York: Henry Holt and Co. ISBN 0-8050-7617-4. Hart, Peter (2011). Gallipoli. London: Profile Books. ISBN 978-1-84668-159-2. Kyle, Roy (2003). An Anzac's Story. Camberwell: Penguin. ISBN 0-14-300187-6. Özdemir, H. (2008) . 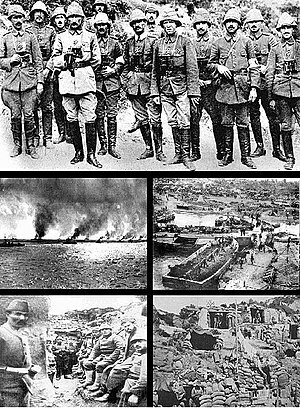 The Ottoman Army: Disease and Death on the Battlefield 1914–1918. Salt Lake City, Utah: University of Utah Press. ISBN 978-1-60781-964-6. Uyar, Mesut (2015). The Ottoman Defence Against The Anzac Landing. Australian Army Campaigns Series. 16. Newport, New South Wales: Big Sky Publishing. ISBN 9781925275018. Waite, Fred (1919). The New Zealanders at Gallipoli. Official History New Zealand's Effort in the Great War. I. Auckland, New Zealand: Whitcombe and Tombs. OCLC 8003944. "Gallipoli Centenary Research Project". Macquarie University. หน้านี้แก้ไขล่าสุดเมื่อวันที่ 26 พฤษภาคม 2561 เวลา 21:14 น.